This month we are working on masculine birthday cards for our soldiers serving on foreign soil. We’ll get together in Room 2215 of the B Building on Wednesday, June 1, at Calvary Baptist Church in Winston-Salem, NC. Wouldn’t you like to come and join us? The community is invited. We would love the opportunity to meet and get to know you! 1. 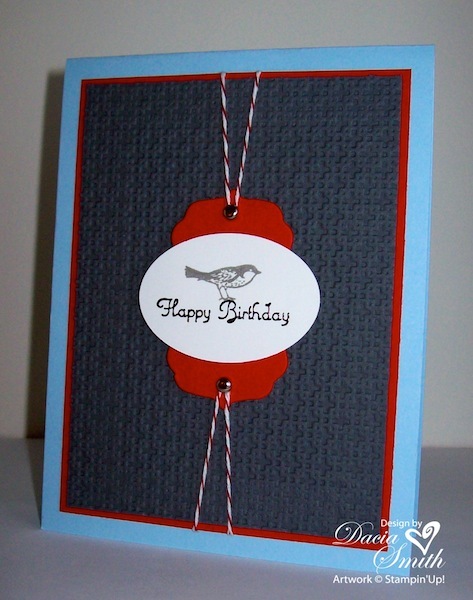 The Square Lattice Embossing Folder added a nice textured background to the Basic Gray card stock. 2. The Stampin’ Up exclusive Matchbox Bigz xl Die has three great labels for putting together an embellishment for your favorite occasion. 3. No card is quite complete without a little ribbon. Isn’t the new Baker’s Twine awesome? It is a great value at $2.95 for 25 yards. Check out my summer schedule posted at “Event Calendar” on the left sidebar! 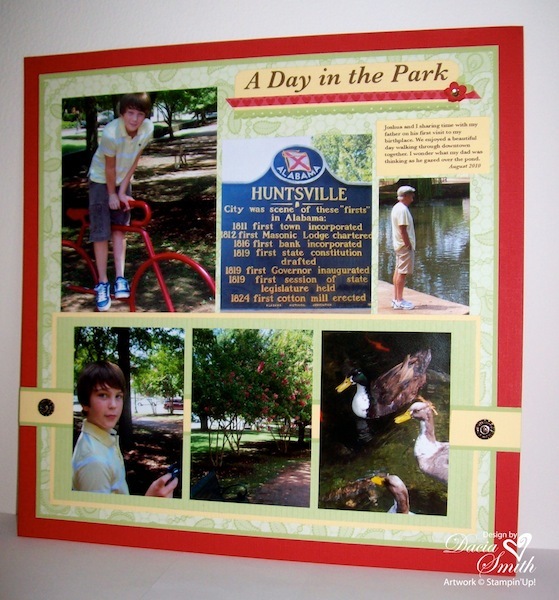 In each scrapbooking class you will complete one 12″ x 12″ page following a template. Today’s post is the template for May. Hope you’ll consider joining us for a class this summer. 1. Pulling your page together is easy when you choose three colors from your photo grouping. My featured choices are Real Red, Certainly Celery, and So Saffron. 2. No page is quite complete without a few embellishments. The Antique Brads are one of my favorites. 3. The title and journaling can be done using various word processing programs found on your computer. 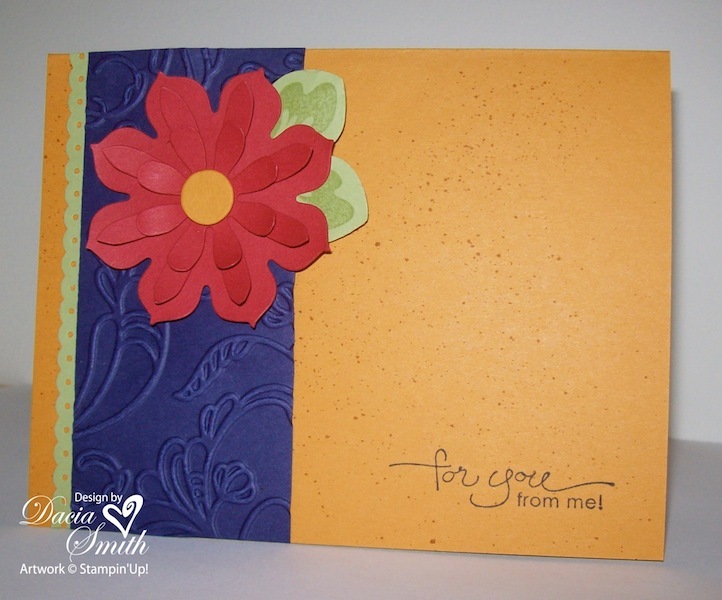 Each Stampin’ Up color has a rgb formula for easy matching. Today marks the beginning of the summer gatherings for Love Notes. The ministry began in June of 2010 with the goal of assembling greeting cards for our soldiers serving on foreign soil. The gatherings are free of charge and open to the community. If you would like to join us, we meet at Calvary Baptist Church, 5000 Country Club Road, Winston-Salem, NC, Room B-2215 on the first Wednesday morning each month from 9:30 am until 11:30 am. We’d love to have you join us. 1. Create a treasure of texture for your project using the Elegant Lines Embossing Folder. 2. The sentiment is from A Word for You. Each stamp offers a wonderful mix of fonts to add a heart felt greeting to your card. 3. The Stampin’ Up exclusive Sizzix die Blossom Party helped to assemble our flawless blossom.